This article was originally written by Fredericton blogger Caveat Doctor on August 30, 2013. The upcoming City staff report on potential Sunday transit service is a great opportunity to review our bus routes in Fredericton. Like any other City programme, the way forward will have to find that elusive sweet spot between delivering the kind of service we want, at the cost we’re all willing to pay. With the increase in call centres and Sunday retail activity, many residents are left without transit access to jobs. Also the university students, particularly with U-Pass programs have a strong desire for Sunday transit. Sunday/Holiday service will be particularly important as other ridership growth strategies are achieved such as the implementation of a UNB U-Pass, employment growth in service industries with 7 day staffing requirements and acceleration of infill development. 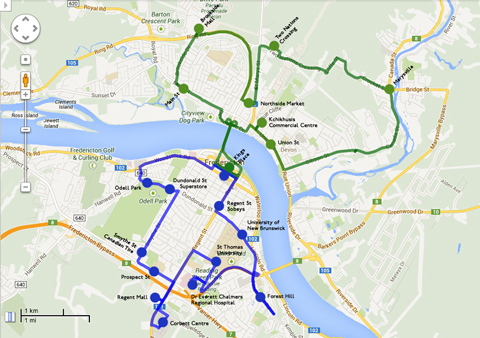 Fredericton’s regular bus route service: tries to put every address in town within close access of a bus stop – but perhaps too expensive and unwieldy for Sundays? One potential system the Plan proposes is a dial-a-bus service. A bus serves a defined area, and you can call to have a pick-up/drop-off within that area. Instead of fixed routes and scheduled bus stops, it’s more like a taxi, but with service within an hour, and shared with other trips already booked along the way, and at regular fares. If you want to get out of the area, the bus will drop you off at a transfer point (eg Kings Place), where another bus will pick you up to take you on to your destination in the other zone. By eliminating fixed routes, a system like this needs fewer buses, and since the buses are only on the move when actually on a passenger call, fuel costs are less too. 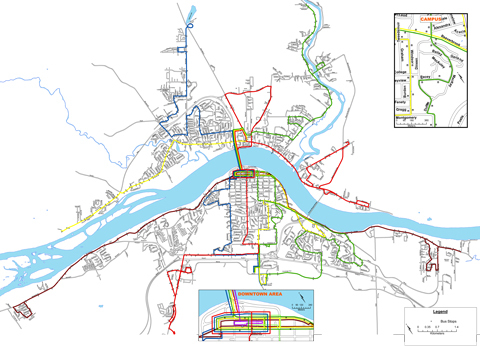 According to the Plan, a zone bus system is only 1/3 the cost of conventional service – in Fredericton’s case, assuming a 4-zone system between the North and South sides, $179 000/year. The Plan highlights that Oakville switched to this system, increasing ridership yet with fewer vehicles. But there are other models out there. For example, during the writing of the Plan, Fredericton Transit was compared to 6 other systems of similar size and rider needs: Kingston, Lethbridge, Moncton, North Bay and Red Deer. Instead of dial-a-bus service on Sundays, these cities offer a streamlined, limited version of their regular routes and schedule. This way, you get reduced operating costs compared to “regular” service, but with a fixed schedule that users can plan around – something that a on-call dial-a-bus system might not offer, which could be especially important for people who need transit to get to work on time. Because a dial-a-bus system works on-call/on-demand, your wait and travel times could vary a lot: you might get lucky and be the only user, and get service almost like a personal taxi. But on the other hand, there might be a crowd in front of you, and you might be waiting. 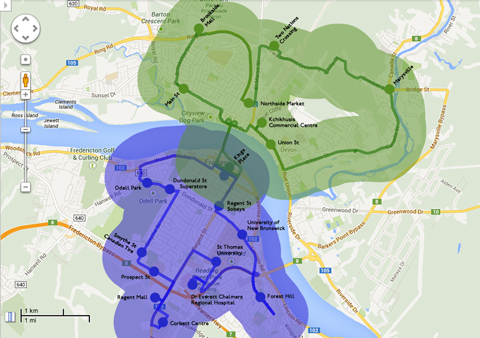 Since this latest push for Sunday service is based around retail access, one way to deliver a fixed-route and schedule service are simple loops, covering Fredericton’s essential shopping options. Loops mean you can get around your side of the river – retail options are generally duplicated on either side, so there’s rarely a need to cross over for the essentials – without having to come Downtown, as you do with the current weekday system. North side: according to Google Maps, this route is 22.3km, or about 40 min of straight driving – with lay-up times, it can be timed to take an hour. Key points: Kings Place, Kchikhusis Commercial Centre, Union St, Marysville, Two Nations Crossing, St Mary’s St provincial government centre, Northside Market, Brookside Mall, Main St.
South side: according to Google Maps, this route is 20km, or about 39 min of straight driving – like the North side loop, it can be timed to take an hour. Key points: Kings Place, Regent St Sobeys, UNB, Forest Hill, Dr Everett Chalmers Regional Hospital/Veterans’ Health Centre/Centre communautaire Ste-Anne, STU, Regent St, Corbett Centre, Regent Mall, Prospect St, Smythe St, Dundonald St Superstore, Odell Park, Woodstock Rd. A streamlined system like these covers much less geographic area than the regular route map, yet provides service for those key destinations and neighbourhoods wherein residents are less likely to already own a car – most of the City population is within a 10-minute walk of the loop. In fact, because it sticks to major roads and avoids as many winding detours – ie, by driving the same path a car would take to get around – it actually would provide faster point-to-point service along the route than the weekday system. It’s one way to find a compromise between service and cost. But more than that, it might also be a useful starting point to re-examine our Transit system from the ground-up. What if we re-focused service away from simply “covering the city”, and instead towards the most common destinations and the neighbourhoods where people tend not to already own cars? What if we concentrated service along the major roads that car drivers use to get around town? A shift like this could put more buses more often where people need them, as well as support more residential and commercial development along Fredericton’s existing major roads, where we’ve already invested on infrastructure. Remember, there are two costs to putting buses in places where ridership is low and service isn’t needed: the actual cost of going there; and the lost opportunity to improve the system where people need it more, because we’re diverting resources. The solutions we come up with for Sunday routes, with that extra sensitivity towards cost and attention on the essentials, just might lead to a better system all week long!